From culinary masterclasses to awe-inspiring sights, Sicily is perfect for culture lovers, foodies and nature enthusiasts alike. 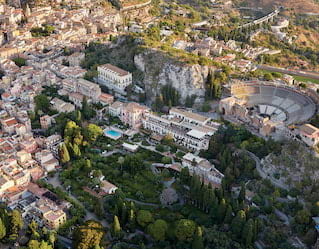 Let our talented team be your guide, and find countless unique things to do in Taormina. Reach the top of the highest active volcano in Europe, where a sommelier will spoil you with a glass of Etna sparkling wine served with tasty local delicacies. Then continue on to a small town near the Alcantara Gorge. 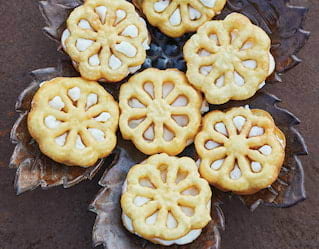 Here, join a group of local women as they share with you all the secrets of traditional Sicilian cooking. A visit to Europe’s largest volcano offers an incredible chance to see lava flows up close. 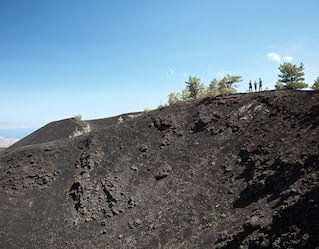 Join a tailor-made Mount Etna tour and head to Alcantara Gorge. Here you can sample Etna’s bounty at local wineries and explore atmospheric lava caverns, such as the Grotta del Corruccio. 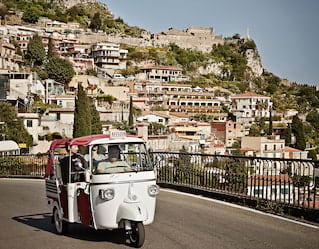 Hop aboard an Ape Calessino for a Dolce Vita Tour of Sicily. 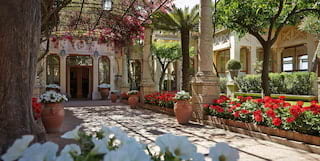 Visit sites frequented by the Hollywood stars of yesteryear, including Casa Cuseni and Castelmola. 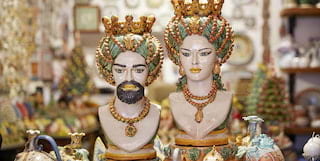 Stops en route allow you to sample sumptuous Sicilian specialities, such as granita and almond wine. Finally, wind up with a drink at ‘Wunderbar’, Tennessee Williams’ favourite watering hole. Take in a show at the ancient Greek theatre, adjacent to Belmond Grand Hotel Timeo. This wonderfully preserved amphitheatre, with Mount Etna as its backdrop, is every bit as captivating as the performances staged there. Admire the stunning vistas of Sicily from a breathtaking vantage point. The lava flows of Mount Etna, the volcanic Aeolian Islands and the Agrigento Valley, with its ancient Greek temples, are all waiting to be discovered from above. 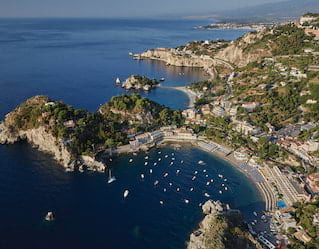 The Godfather was filmed in Savoca, 20 minutes north of Taormina. This typical Sicilian village will resonate with fans of Francis Ford Coppola’s masterpiece. 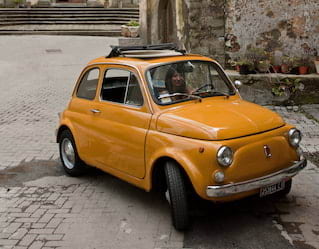 Travel by Fiat 500 and Follow in Al Pacino’s footsteps, visiting Bar Vitelli and the Church of St Lucia. 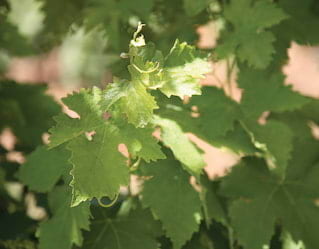 Immerse yourself in all things wine-related on this idyllic adventure. 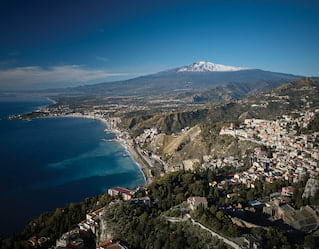 Sample the rare vintages of Mount Etna; join experts in a visit to some of the best local wineries; or take a vineyard stroll to learn about wine production, before tasting the delicious varieties yourself. Sail to the magical island of Filicudi to feast on warm Aeolian hospitality. Here, jewel-like fruits are grown in abundance beside bright bougainvillea and the cobalt-blue sea. Head to the homes of the three extraordinary islanders and learn more about their unique way of life on this exclusive tour. Chances are, you won’t want to leave. Curve the coastline aboard a traditional Sicilian boat. 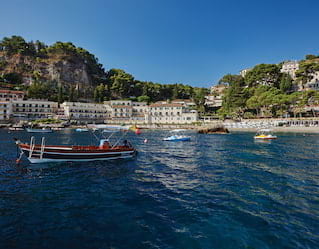 Set sail and head to the Blue Grotto, Isola Bella, the Gulf of Giardini Naxos, the Fortune Cave and the Siren’s Bay. During the trip you will also have the chance to stop for a refreshing dip in the shimmering waters.